· 3 times faster than Add/Remove program! · 3 applications categories: Software, System, Hidden. · 3 ways of sorting applications: by Name, by Occupied Size, by Installation Date. · Remove programs that could not be removed by Add/Remove program. · Force removal of uninstall related entries in the registry. · Fast search feature allows quick finding of any application you need. · Navigate to a selected program's Registry Entry, Installation Folder and its Web Site. 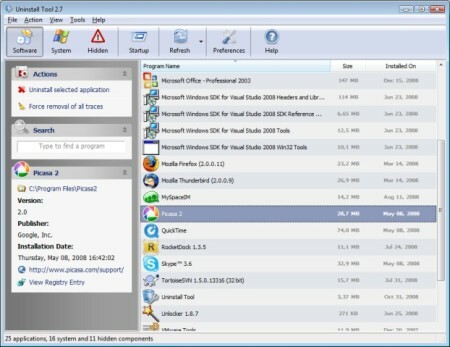 · View detailed information of a certain application installed on your computer. · Easy to use and modern user interface allows to work comfortably with Uninstall Tool. · Option to replace Add/Remove program.